Dressing is a close second. If you're celebrating Thanksgiving tomorrow, what food are you looking forward to most? If you're not celebrating, what are you craving right now? I could never like any kind of pie. For some reason, we never really made yams/sweet potatoes for Thanksgiving growing up. I don't know why. Somewhere along the way we started making them and they are probably my favorite thing. I guess it's the brown sugar, pecans, and marshmallow mixed with the sweet and salty potato. It's like dinner and dessert all together. And Hubby's grandma makes these potato rolls that I would do almost anything for! Mashed potatoes . . .only my Aunt and my Mom-in-law make them just right. I've never been able to make them like they do . . . I've learned that there's really an art to making mashed potatoes, and when they're good, they're awesome! Ahhh, me too, can't wait to eat my slice of Pumpkin Pie! It's so delicious! But what I really LOVE is the turkey and stuffing! And the dessert is the best part of the big feast! I am craving my mashed potatoes. Delicious, even if I say so myself!! I just made the Pioneer Woman's mashed potatoes and had a bite to test them. Awesome!!!! And chocolate pie. Not a pumpkin lover though. You and you family have an amazing and tasty holiday!!! Pumpkin chocolate chip muffins! Happy Thanksgiving! Collards! Southern girl has to have those collards. While I like turkey ok, if there was nothing but collards, I'd be happy. My sister is cooking, and I'm making the pumpkin pie. I could eat the whole pie by myself. Have a lovely Thanksgiving with your family! Me too! 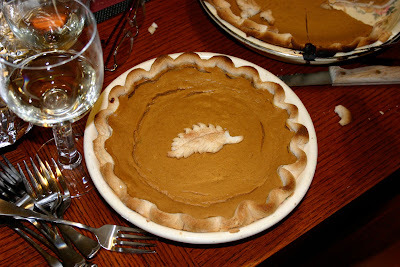 I miss eating pumpkin pie so much! I like many different kinds of pie, but I always crave pumpkin this time of year. And candied yams are a close second! Yum! Happy Thanksgiving to you as well! Nothing better than a delicious pumpkin pie with whipped cream after an ample serving of stuffing :) Have a great Thanksgiving!!! You've got that right! :) Happy Thanksgiving! Mashed potatoes and rolls dripping with butter. I'll skip the stuffing and the brussel sprouts and even the turkey, to have more mashed potatoes!